Diapers, cotton swabs, bottles and wrappers are littering reefs. A new study finds they're causing widespread damage. 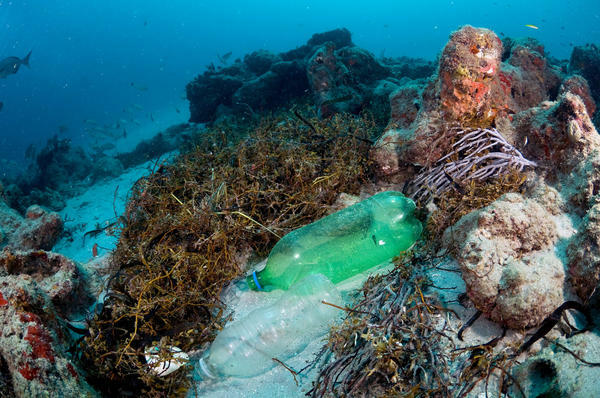 A survey of 150 reefs found plastic was a common pollutant. "The likelihood of disease increases from 4 percent to 89 percent when corals are in contact with plastic," researchers report in the journal Science. Senior author Drew Harvell at Cornell University says the plastic could be harming coral in at least two ways. First, bacteria and other harmful microorganisms are abundant in the water and on corals; when the coral is abraded, that might invite pathogens into the coral. "It's certainly well known that plastics abrade corals, create new openings," she says. "They basically tear open the skin of the coral and that can allow an infection from anywhere to start." In addition, Harvell says, plastic can block sunlight from reaching coral. Her group found increased risk of four diseases in coral in contact with plastic. "This is a huge survey," says Harvell. It was the idea of Joleah Lamb, who was at the time, a graduate student. "There are really great studies showing how much plastic is going into the oceans and how much is floating on the surface," says Lamb, who's now a fellow at Cornell University. "But we really didn't have an idea about what's underneath the surface of the ocean." The more they looked, especially in Asian waters, the more they found: bottles, diapers, cotton swabs, food wrappers. They noticed that coral that had plastic didn't look healthy. Based on how much plastic the researchers found while diving, they estimate that over 11 billion plastic items could be entangled in coral reefs in the Asia-Pacific region, home to over half the world's coral reefs. And their survey did not include China, one of the biggest sources of plastic pollution. 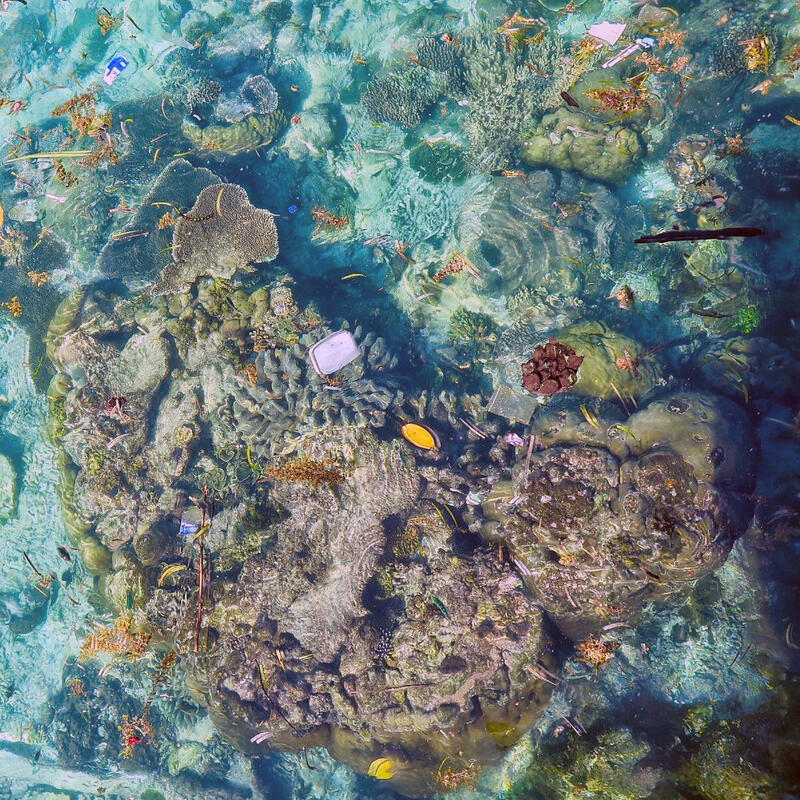 Australian reefs had the least amount of plastic observed on reefs, which the researchers attribute to a more comprehensive system for waste control. Other countries in the Pacific don't have much control over what ends up in the waste stream. "Massive amounts of plastic are being thrown into the oceans from land," Harvell says, in countries that don't have much recycling and with dumps that are often adjacent to the ocean or waterways that run into the ocean. Coral reefs already are susceptible to bleaching due to unusually warm water, either from seasonal shifts in water temperature or from human-caused global warming. "Bleached coral is more susceptible to disease," Harvell says. "The bleached coral is stressed. Plastic would make things that much worse." Matthew Savoca, a marine scientist at the the University of California, Davis, who studies the effects of plastic in the ocean, suggests that ocean waters with lots of plastic waste might also carry other pollutants that could also be contributing to higher rates of coral disease. But Lamb says they found that corals within yards of each other showed a noticeable difference: Those with plastic were much more likely to be diseased. "It seems to be something associated with the plastic itself," says Lamb. Exactly how the plastic is causing disease is still unclear. What is clear from numerous studies is that the amount of plastic getting into the oceans is on the rise.